Follow the Frog with us! 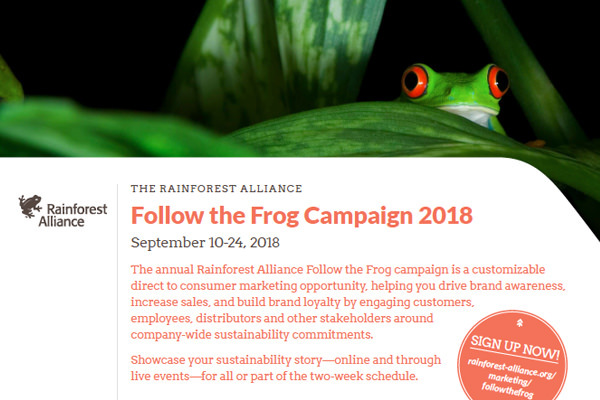 The Rainforest Alliance annual Follow the Frog campaign is a customizable direct to consumer marketing opportunity, helping you drive brand awareness, increase sales, and build brand loyalty by engaging customers, employees, distributors and other stakeholders around company-wide sustainability commitments. Businesses are invited to join all or part of our two week promotional program highlighting your company’s commitment to sustainability and support for the Rainforest Alliance. Our 2018 campaign took place September 10-24, thank you to all our collaborating companies for making it such a great success–your captivating videos, educational events, and social media posts have helped spread the message of sustainability, and mission of the Rainforest Alliance to millions of people around the world. Stay tuned for our 2019 campaign dates, which we will post here soon. You can also subscribe for updates in the box to the right of this page, and, as always, reach out to your Rainforest Alliance contact for more information. For questions or details on how to get involved, or to discuss other marketing opportunities outside of Follow The Frog, connect with the Marketing team at marketing@ra.org. For ideas and inspiration, see some of the activations and impacts of the 2018 campaign, or even from the 2017 campaign. Below you will also find some quick overviews in the form of a one-page PDF, and a three-slide PowerPoint, to help engage the rest of your team. Learn more by flipping through the different subsections by clicking the tabs in the left-hand columns to find additional materials, including downloadable graphics, messaging toolkits, and more in depth blogs. What will the Follow the Frog campaign deliver? Engage with customers, employees and stakeholders on the issue of sustainability – a key driver in brand choice and purchase decision. Raise the profile of your products carrying the Rainforest Alliance Certified™ seal. Highlight your company’s work with the Rainforest Alliance and the commitment to sustainability and to helping planet and people prosper together. A toolkit of messages and materials that can be used turnkey or customized for your brand. Active support on Rainforest Alliance vehicles – website, blogs, Facebook, Twitter, Instagram, videos, slide shows, and online events — to promote our shared mission and highlight collaborating companies like yours that have made a commitment to sustainability. 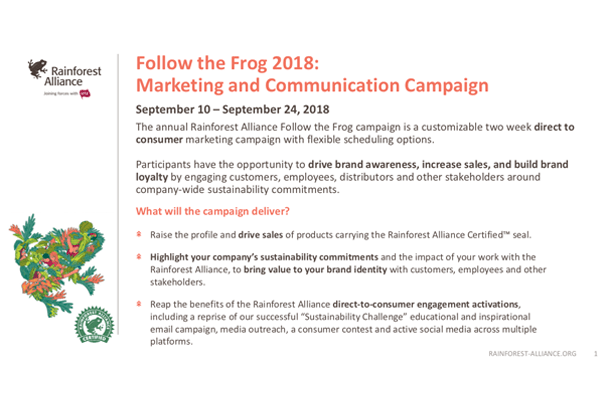 Benefit of a direct-to-consumer activation program executed by the Rainforest Alliance to engage citizens in Follow the Frog. Mark your calendars and add Follow the Frog to your marketing and communication plans. Contact our team at marketing@ra.org to discuss how you can participate, and sign up for updates in the box to the right. By subscribing, you'll also receive general updates about the Rainforest Alliance's work and ways you can get involved.